Ready for your UFC Fight Night: Hunt vs. Bigfoot predictions? Admit it - having a Friday night fight card is kind of cool. While that pesky thing known as work is likely going to mean some West Coast fight fans are going to miss a large chunk of the preliminary portion of this fight card, there is still something genuinely awesome about getting home from the office, kicking off your shoes, grabbing a cold beverage, and watching grown men (and two grown women) punch each other in the face for any number of hours. Sure, you could go out and have a night on the town, but after a hard week at the salt mines, doesn’t unwinding in the comfort of your living room as 11 pairs of fighters try valiantly to knock each other out sound far more enjoyable? Stay home Friday night and watch the fights, run those errands and do those chores Saturday before heading out, and recover for your (mis)adventures Sunday afternoon with the NFL on FOX. There ‘ your weekend is officially planned. You’re welcome. 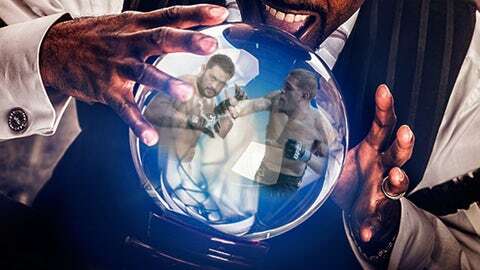 Here are the UFC Fight Night: Hunt vs. Bigfoot Crystal Ball Predictions. With these two behemoths meeting in the main event, there is very little possibility of this turning into anything but a really entertaining scrap. Both Silva and Hunt like to set their feet and fire potential knockout blows in high numbers, which means there is a very good chance this one ends in spectacular fashion. And that type of battle favors Hunt. Even coming off a stoppage loss to Junior dos Santos, Hunt still has one of the best chins in the sport, and he’s not afraid to eat a shot or seven in order to land that one bomb that turns the fight on its ear. Which is precisely how this fight should play out ‘ Hunt comes forward, Silva lands some good blows, but ultimately, ‘The Super Samoan’ changes things on a dime with a big left hand that causes the partisan crowd to erupt. If he’s healthy and focused, turn to page 192 and read about him throttling Te Huna in vintage fashion. If he’s extra-doughy around the waist and looks like the guy that has lost consecutive fights, turn to page 207 and read about Te Huna pounding out the biggest win of his career. As great as Rua once was, those days are gone, and until he shows that he’s capable of recapturing that form, it’s hard to pick him. Te Huna, meanwhile, has always shown himself to be game, no matter the challenge, and has the kind of gnarly power that can be problematic for a hittable, lethargic version of Rua. Regardless of how the rest of the night goes for the local favorites, the final two bouts will send the Australian fans home happy. Bader needs this victory in a major way, and there is no reason he shouldn’t emerge from Australia with another win in tow. Perosh earned a tremendously enjoyable flash knockout win over Vinny Magalhaes last time out, but the 41-year-old submission specialist is simply not in the same league as the former Ultimate Fighter winner athletically, and Bader should be able to use his physicality to get the best of ‘The Hippo’ here. Look for Bader to come forward aggressively from the outset, looking to score with the big overhand right, while keeping Perosh at the end of his punches. He’ll hem Perosh in along the cage, land with authority, and get the much-needed tick in the win column. Those that study history and/or patterns will say Barry is going to win simply because he lost his previous outing and alternates wins and losses, but the more scientific and researched-based analysis is that Palelei looked awful in his ‘so bad that it is actually good’ match-up with Nikita Krylov that it’s impossible to see any other outcome besides Barry lighting him up. This is one of those fights where records get tossed out the window, because Barry has been plying his trade against UFC opposition for a number of years, while Palelei has been beating up has-beens and never-wheres at home on the way to a 10-fight winning streak and an inflated mark of 19-3. Barry will chop at his legs with nasty kicks, and put him away with a blistering shot upstairs. These two were teammates on Season 17 of The Ultimate Fighter, with Andrews ‘ the last pick of the competition ‘ advancing further than the man coach Jon Jones selected much earlier. That track record dictates the selection here. As much as Hester appears to be a hulking mass of raw potential, there are still a lot of holes in his game, and he’s more athlete than fighter. Andrews, on the other hand, is a mix of heavy hands, iron chin, and all kinds of intangibles that you just can’t teach, and it those elements will once again serve him well here. ‘The Villian’ will weather an early onslaught from his younger, faster opponent, and rally once Hester starts to fade before dropping him to the canvas, where he’ll sink in a fight-ending choke. Kedzie is a pioneer in women’s MMA, a tremendous ambassador for the sport, and the kind of self-aware awkward person that is impossible not to love. She’s awesome, which makes it hard not to root for her every time out. But it feels like women’s MMA has turned the page and started a new chapter, and this fight should once again illustrate that younger, more athletic competitors like Correia have passed the veteran class that includes Kedzie. With five decisions in six career victories, it appears that Correia lacks the power to end this fight in a hurry, but if she fights anything like her coaches, Patricio and Patricky Freire (a.k.a. The Pitbull Brothers), here aggressiveness should allow her to edge out Kedzie, who looked tentative and unsure of herself at times in her debut loss to Germaine de Randamie. Making the freakishly long fight to Australia before making your initial appearance down a weight class against a perennial fringe contender doesn’t sound like a winning formula for Phan. Mizugaki has been the more active, more successful, and generally more impressive fighter of late, and that should continue here. Phan will put forth an inspired effort ‘ he almost always does ‘ but the Japanese veteran will simply be too technical and too powerful for him in this one. Can Ring pick-and-poke from the outside and keep the fight standing long enough to earn the victory on the scorecards? That is the question at the heart of this fight, and the answer is no. Magalhaes is a big middleweight, and he will find a way to close the distance on the Canadian, turning this into a clinch battle and, ultimately, a test of Ring’s submission defense on the canvas. Ring is tough to put away, but Magalhaes should be able to bully him around the cage and put him into enough defensive positions to secure the decision. As much as Scoggins has yet to face any real competition on his way to an unbeaten mark and a chance to step into the Octagon, it’s not like Vaculik has been facing a Murderer’s Row of opposition either. Sometimes, being young, tough, and confident is enough to get you through tests that should be much more difficult than they end up being, and that is essentially what will carry Scoggins to victory. While flying halfway around the world to fight a popular local on his home turf in your UFC debut could understandably lead to a ‘deer in the headlights’ situation, look for Scoggins to act like he’s still knocking out cans on the regional circuit back home in South Carolina. In a battle of unbeaten newcomers ‘ with matching records no less ‘ look for the 24-year-old Jotko to take advantage of his size advantage to keep Santos from closing the distance and making this a grappling match. Neither has shown much power along the way ‘ or even a real inclination towards submissions either ‘ so this one should come down to the scorecards, with Jotko throwing more, landing more, and taking home the win. This one is pretty straightforward: Garcia is a compact ball of power and fury that trains with the all-star cast of coaches and fighters at the Tristar Gym in Montreal, while Wall is a short notice replacement fighting up in weight. Garcia lights him up early and kicks off the night with a bang.